I’ve neglected meat eaters somewhat as I rarely eat red meat myself, so here’s something that will hopefully make a lovely change from the usual grilled steak supper. The combination of crème fraiche and English Stilton cheese sounds rich but it really isn’t. It’s more of a delicious condiment rather than a smothering sauce and the addition of watercress keeps it lively and fresh-tasting. I only use organic grass fed beef or bison but regardless of your steak source, this dressing works extremely well! Pre-heat the grill or ridge based grill pan. Put the chopped shallots and Madeira in a small pan and simmer until reduced by half. Add the crème fraiche and bring it back to a gentle simmer for a few more minutes. Stir in the crumbled Stilton and allow it to melt over a gentle heat. Add the chopped watercress and adjust the seasoning to taste – keep warm. Grill the steaks: 4-6 mins on either side for rare; 8-10 mins for medium; 10-12 mins for well done. Transfer to a warmed serving plate and allow them to rest for a few minutes to tenderize. 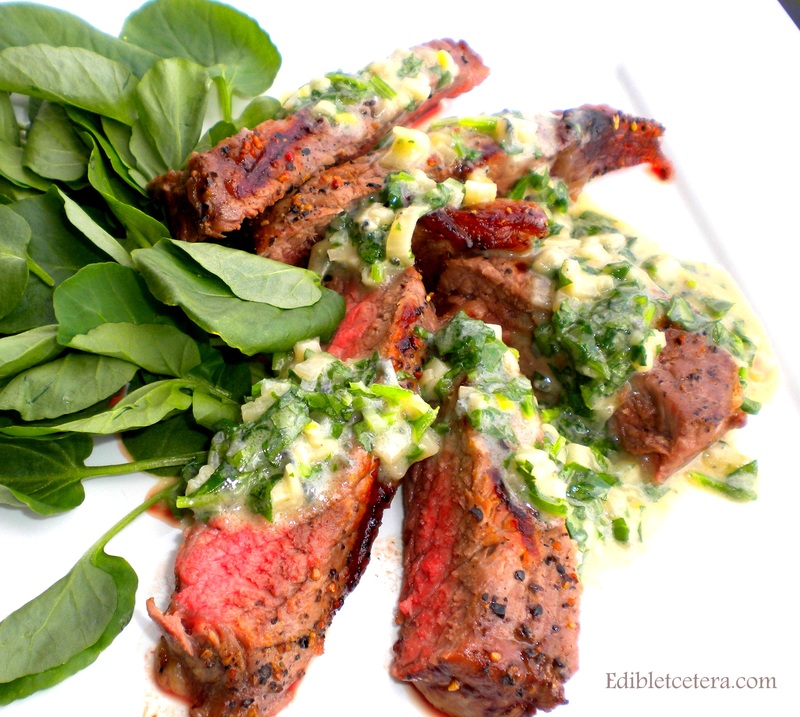 Slice the steaks and serve with the sauce and the remaining watercress. Some boiled baby potatoes would go very well on the side. This entry was posted in Made in Under 30 mins, Meat. Bookmark the permalink. I don’t even like or ever eat steak, but this looks delicious and I’d love to eat it!